When you buy a Kindle Paperwhite for your child, it will be registered to your Amazon account. Your child will have access to the Kindle Store to make purchases as well as being able to view and download books in the Cloud. 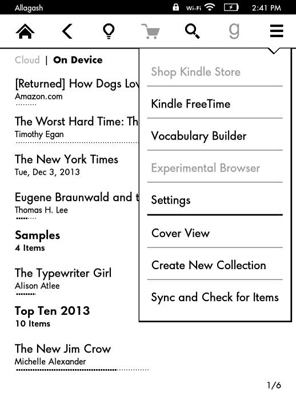 The Kindle’s experimental web browser and the Goodreads app are also accessible. You can restrict your child’s access to all four by using parental controls. To access parental controls, tap Menu→Settings→Device Options→Parental Controls→Restrictions. The screen shown in Figure 1 appears. Tap the toggle switch for Web Browser, Kindle Store, Cloud, or Goodreads to restrict access. You’ll be asked to enter a password, as shown in Figure 2. Input a hint to help you remember your password. Figure 1: Set parental controls for the web browser, the Kindle Store, the Cloud, and Goodreads. 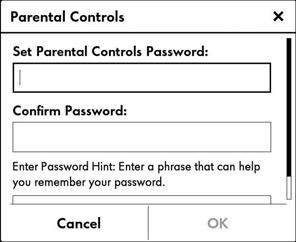 Figure 2: Set a password for parental controls. Note that when access to the web, store, or Cloud is restricted with parental controls, you will not be able to deregister your Kindle Paperwhite, nor will you be able to update the software running the device unless you use the password to unlock the device. The Shopping Cart and Goodreads icons are also dimmed, as shown in Figure 3. Figure 3: Note that shopping, the experimental browser, and Goodreads appear dimmed when parental controls are turned on. Parental controls affect only the local Kindle on which they are enabled. Other Kindles on your account can still access the Cloud, Goodreads, the Kindle Store, and the Kindle web browser. Only you can decide if you need to use parental controls for your child’s Kindle. When these controls are on, your child cannot sample content, download free books, or borrow books from the Kindle Owners’ Library (if you have Amazon Prime). On the other hand, without parental controls, your child has free rein to buy things from the store — on your credit card — and can see and download books in the Cloud. You need to weigh these alternatives to make the best decision.